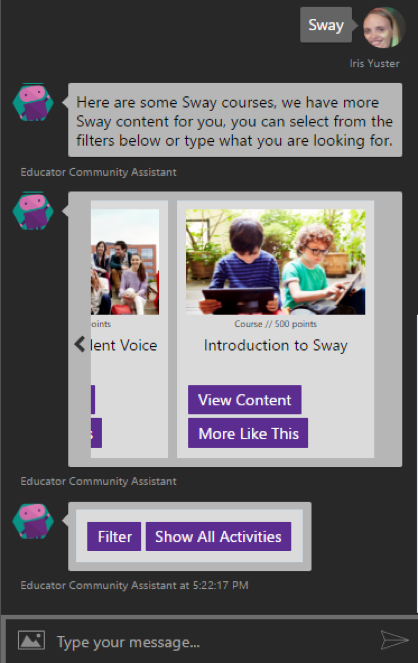 The Microsoft Educator Community recently launched a new bot built with the Bot Framework to provide educators with a personal human-like assistant that can direct them quickly to relevant content. One of the key roles of the bot is to help educators better engage with Office 365 and develop their teaching skills with Microsoft’s Office products. Since the bot was added to the site in January, engagement with the bot has been high, with over 40,000 messages from educators being exchanged. Educators have found the bot to be human-like, valuable, and easy to use. They shared positive praise for its assistance and helpfulness. 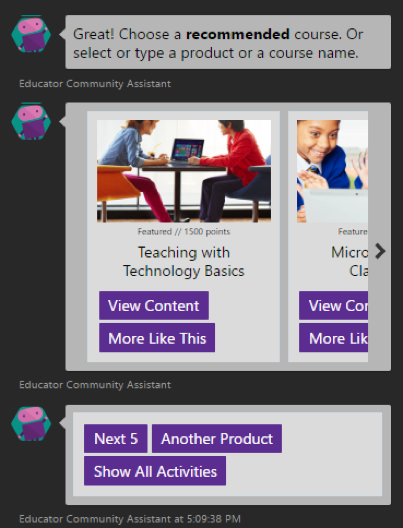 In fact, Microsoft is beginning to see a trend towards educators preferring to start their engagement on the site with the bot. Educators who use the bot during their visit to the site have 3-times longer session duration and 2-times higher number of page views per session. The Educator Community bot combines pre-defined scenarios to define users’ intents and flows. The scenarios support business KPIs flows, as well as free text dialog messages for over 60 intents. The bot’s first message includes a personal introduction and set of expectations, describes what the user and the bot can do, and gives an option to start the interaction with one of the pre-defined scenarios. For example, when the educator selects “Courses,” he gets a set of featured courses to select and start consuming Office 365 content. It is important to direct the user through the pre-defined dialog to other options and enable continuous interactions, such as “browse more courses”, “find another product”, “go back to all activities”, or write a free text message. In human-to-human conversations, the participants usually don’t have to predict each other’s intents or plan their answers. In human-to-bot conversations, an intelligent and effective bot should be able to anticipate user intent and answer it with the correct per-defined dialog script. In this example, the user couldn’t find an interesting course and typed “Sway.” The bot then searched and presented relevant Sway items, and offered the user some options of how to continue. To maximize business KPIs with the bot, users have to get only the pre-defined scenarios that are relevant to their based on their profiles, behaviors, and interests. 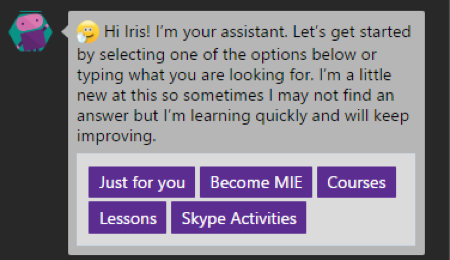 CLICK HERE to read the full article and find out how Chatbots are providing Educators with personalized assistants, while also helping them better engage with Office 365! To learn more about Chatbots and how Chatbot Technology can automate business processes while maximizing company engagement and support, CLICK HERE.